Born in New Jersey, US in 1982, and living in Hamamatsu city. He is the first person from non-kanji-used country who passed the first-grade certificate in Kanji Kentei (Japan Kanji Aptitude Test). Calling himself “Kanji geek”, he now plays an active part as Kanji educationist certified by Ritsumeikan University after his career as an English teacher and translator. He got interested in Kanji because he enjoyed Japanese animations in animation club when he was a high school student. He came to Japan for studying as a college student. As being fascinated by Kanji more and more, he visit to Japan again, and came to Hamamatsu. Since then, he started challenging Kanji Kentei. Smoothly passed the grades, he finally passed the most difficult grade, the first-grade, at his 5th challenge in 2012. He became popular through mass-media as a foreigner who knew about Kanji much more than Japanese did. He even knows the origin and meaning of Kanji and also passes the second grade of Kotowaza Kentei (test on proverbs) . His affectionate attitude toward Japanese language and friendly character makes him popular and now he is liked by everybody as “Mr. Bu”, and appearing on local television and radio regularly. His way of remembering Kanji is unique, which is totally different from that of Japanese students. His books “The exercises in Kanji by Bread Method” and “My First KANJI Book” are popular among not only foreigners but also Japanese people. “Kanji is an Art”, Mr. Mayer says. 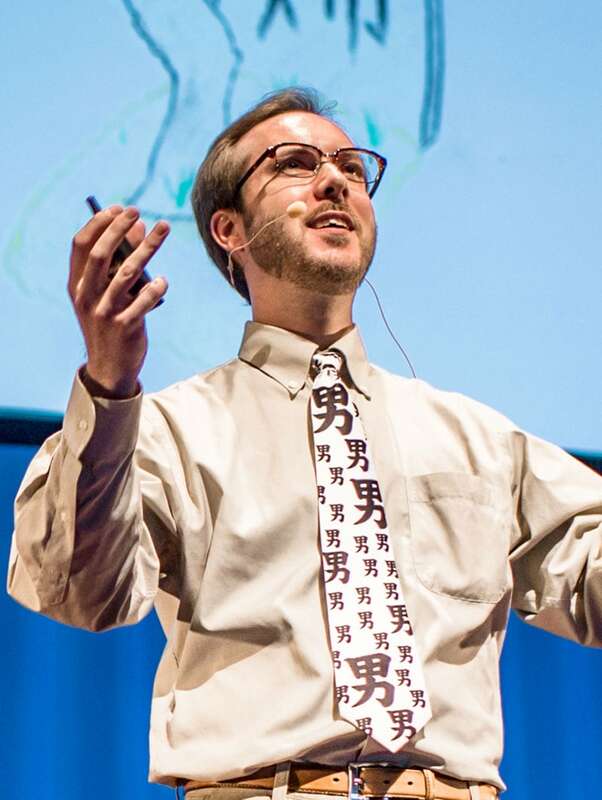 We cannot miss his unique activity of telling many people how fascinating Kanji is.